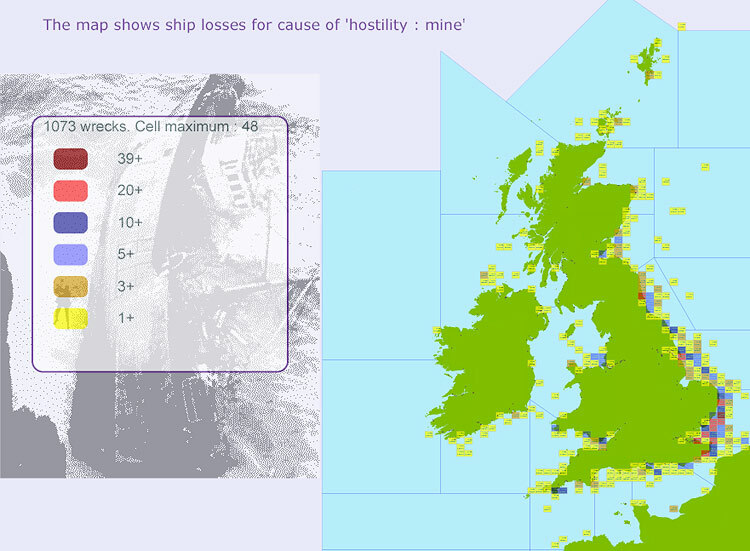 Above: Cells (20' x 10') showing Cause of Loss - Hostility : Mines : All - Shipwrecks UK area, zoomed-out view. 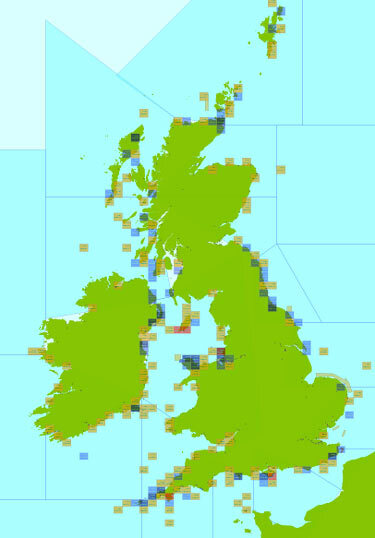 Cells are colour-coded to highlight the density of wrecks meeting the search criteria. 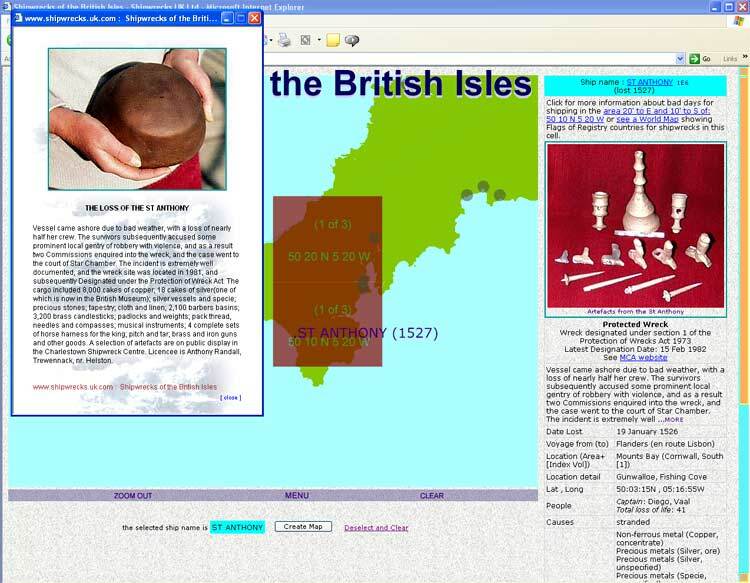 Users can 'drill down' to see more detailed information. Below: An example of connections between shipwrecks, in this case those sunk by mines laid by destroyers Z-10, Z-15 and Z-16 on the night of 18th/19th November 1939, using the facility to instantly 'Map Connected Wrecks'. 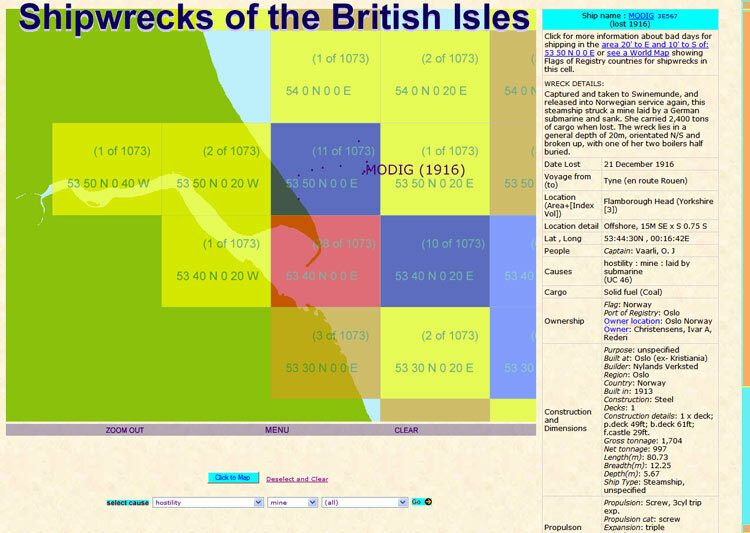 Above: From the zoomed-in view of a small section of the hostility/mines display, clicking on a cell shows each wreck that fulfils the search criteria, showing individual wreck names and year lost on mouseover and full details on further click. 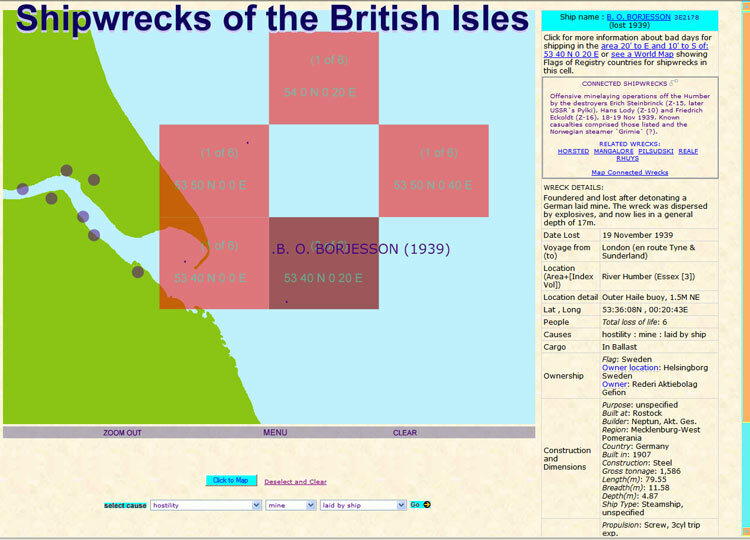 Below, left: Ship casualties of the `Big Wind`. Below, right: Ship losses where the cargo was salt. 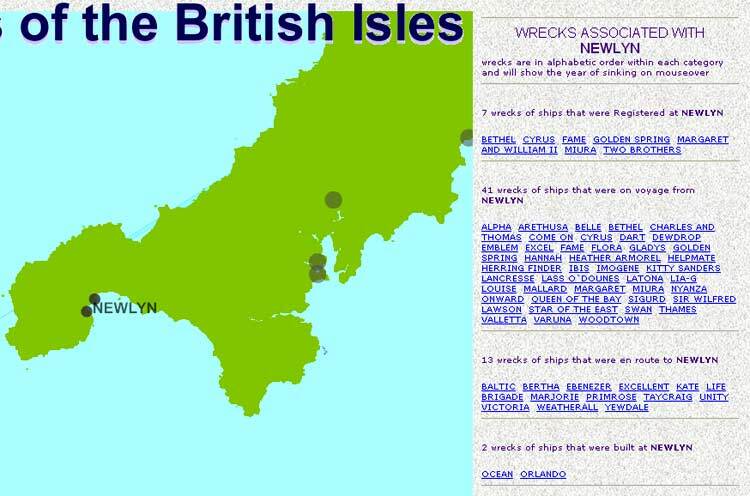 Below: Each port marked on the map is interactive and yields hyperlinked information about those ships wrecked in British waters that were Registered at the port, en route to or from it, or were built at that location. 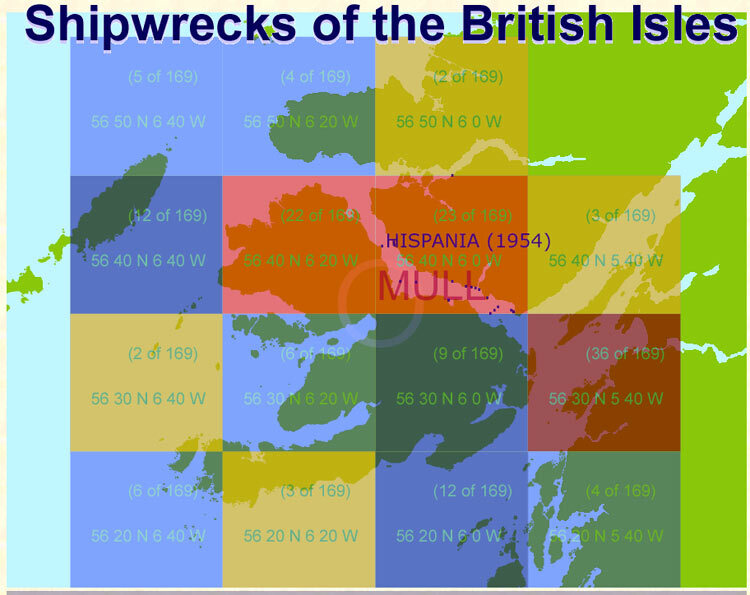 Distribution of these shipwrecks can then be instantly visualised by mapping the entire selection. 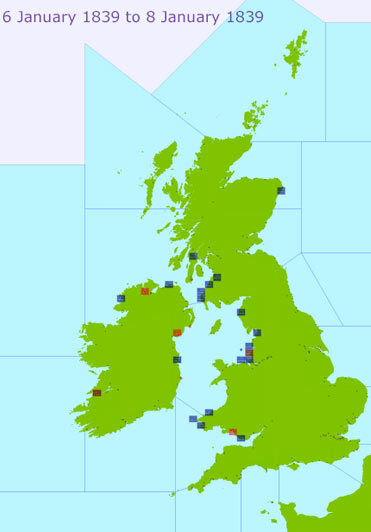 Below: All ship losses within a 80 x 40 nautical mile area centred on a selected location; individual wrecks shown within one of the 20 nm x 10nm cells.